Free Music Friday! Parenthetical Girls - "the Pornographer"
Ever the pragmatists, Parenthetical Girls are in the midst of releasing Privilege--the band's new full length--as a box set of five extremely limited 12" EPs on their own Slender Means Society label. These EPs will be sold separately in sequence every quarter over the next 15 months, each as they are completed. They will not be distributed to stores. As the cycle concludes, the fifth and final 12" will come packaged in a beautiful, aesthetically cohesive LP box designed to house all four of the preceding releases, forming the complete Privilege album. Limited to 500 physical copies per EP, the 12"s will each feature original art by renowned Swedish illustrator Jenny Mörtsell, and will be hand-numbered in the blood of their respective band members. The third 12"--subtitled Mend and Make Do--will be released on March 22, 2011, and will be numbered in the blood of cover star Jherek Bischoff. Having taken pop extravagance to its logical conclusion with their critically acclaimed Orchestral Pop opus Entanglements, Parenthetical Girls have given the orchestra their leave--and the resulting transformation is no less momentous. Returning to its core membership of vocalist/creative director Zac Pennington, multi-instrumentalist Rachael Jensen, and producer/arranger Jherek Bischoff, the group set about a path that they have heretofore never really charted: that of sonic restraint. And though the results could scarcely be called subtle, the language of Privilege is direct and unambiguous--a new creative candor that's felt in both its words and music. 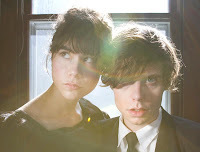 It's Parenthetical Girls in fighting trim, and the difference is both immediate and undeniable. The group continues this ambitious experiment with Privilege, pt III: Mend and Make Do --a bizarre and bombastic four-song suite of transgression, sexual politics, and bliss debasement. The EP opens upon lead single "The Pornographer," a leering Blues number (A BLUES NUMBER?!?!) of lust gone wrong, that recalls the unlikely bravado of light-loafered forbearers from the Bad Seeds to Depeche Mode. "For All The Final Girls" follows, a quietly frenzied chamber piece about the inescapable shadow of the past, and of the privileged evasion of personal responsibility. "Careful Who You Dance With" is a cautionary tale of revelry awry, while "Mend and Make Do (Found Drama II)" continues the fragmented, kitchen-sink pathos begun on Privilege, pt. I. Together, they comprise a bold, strikingly cohesive pop clarion call that further solidifies Parenthetical Girls' place amongst the most surprising and uncompromising pop groups at work today. And there's more where that came from. Parenthetical Girls drops Privilege: Pt. 3 - Mend and Make Do via Slender Means Society March 22.